I really should keep up with my diary more frequently but it seems that my life has been one whirlwind after another. I can’t believe how much has happened to me over the past 2 and a half months. Here I sit in my own little house, well it’s not mine but it feels like it is. I am not sure why Minnie and Cora took me under their wings to help me but I can tell you the truth, they are truly angels in disguise. They keep telling me that they see something in me that draws them to me. I don’t know what that means but I am grateful. I have been going with them to church ever since I got out of the psychiatric hospital. Minnie calls me every Sunday morning to go to church. She has been such a blessing to me. I still don’t understand it all but I know that it was God’s plan for her to meet me along the road that day back in October. It was His plan to get me back into church and back into my relationship with Him. I am amazed at how He works. Sometimes I think about the homeless people that I would talk to when I was out in the streets. Those people are still out there and I wish I could help each of them like I have been helped. I would have all of them come and live with me but there’s not enough room. Haha! I am not sure I would want to do that anyway. Being homeless is a state I don’t ever want to live through again. Many of the people I met are content to live in the streets because they have no families or they are alcoholics or drug addicts. I didn’t have addiction issues, I was just depressed all the time and suffering from PTSD. You know what’s funny is I have a joy inside of me that has not been there in a very long time. It’s the joy of the Lord. I hope and pray that it never goes away. It’s a great feeling. I still have many things that I need to work on before I can actually say that I am completely healed but I am surely on my way. Jesus is a healer. June 9th and 10th…oh the memories these two days hold. First terror, second new life and third new career. It’s amazing how God can turn things around in our lives when we surrender to His plans and purposes. First there was one of the worst days in my life. Twenty one years ago, a night like no other. Nine hours of violence, torture, fear and pain. God prepared me for that night but I just didn’t know what it would look like. I learned that night that you could cry with no tears. Throughout the situation I prayed in my head and trusted that God would hear my prayers. I will spare the details of what happened but suffice it to say that I should have been hurt much worse but because of my size and weight I was spared any broken bones. I survived. Was it God’s plan for me to go through such a horrendous circumstance twenty one years ago? No, but He saved my life. He made a way out for me and even though it was one of the hardest seasons in my life, His grace was sufficient, His banner over me was Love and His peace is what sustained me. Three years later, after trying to fix my life my own way God stepped in and moved me to a new location. A place where I never thought I would fit in. A place that would turn out to be the best thing in my life. Four years later, I stepped into a new career. A job where I would learn and grow. A place where I would eventually cultivate close relationships. Here I am today, twenty one years later looking back over the years. There have been many hard times and yet I’m still moving forward. Each year I have found myself becoming depressed in the month of June. Each year I have re-lived that one night from twenty one years ago. 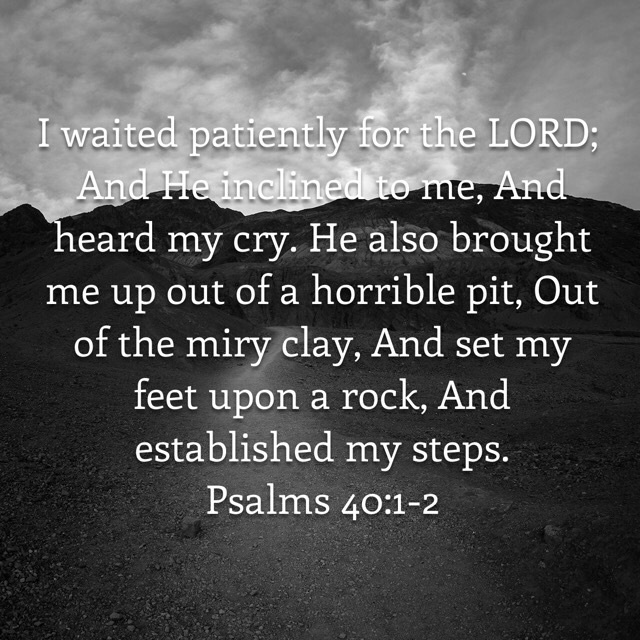 While so many people would be celebrating graduations and birthdays and weddings in the month of June when summer finally brought forth sunshine and beautiful skies, I would just sink back into the miry pit that God had rescued me from so many years ago. It has been a cycle of depression and despair for so long. But today I truly feel that it’s over, it’s done and my healing is complete. I don’t feel the pain anymore. It’s just a memory, a time in my past that I can call a victory because I survived. I don’t feel the depression anymore and I can truly say I’m ready to give back now. I’m ready to help someone else who might be in the thick of the miry clay. I spent ten years trying to figure it all out on my own and then the next ten years letting God lead me and I have to say that it’s much better when we surrender and let God guide us.